Lesson 6 in the “SharePoint Server 2013 Administration” Arabic course is now available on SharePoint4MEA YouTube channel, you can watch it from here. Merry Christmas and happy holidays to all those who are celebrating. 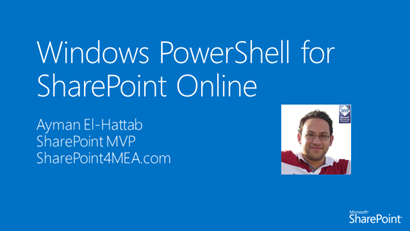 Yesterday, we’ve published our 5th lesson in the “SharePoint 2013 Administration” Arabic course. You can find the video here. SharePoint-Journey.com has done a very good job putting together a very useful video about SharePoint Hosted Apps. In the video, you will learn how to develop your very first SharePoint hosted app and experience all possible errors you might encounter during development. The video also covers the ways you can resolve those errors. I usually refer to this video in my presentations and events. The product group released the December 2013 Cumulative Update for the SharePoint 2013 product family. Please also have a look at the article that discusses how to properly patch a SharePoint 2013 farm which has Search enabled. Previous releases of the SharePoint Server 2013 cumulative update included both the executable and the .CAB file in the same self-extracting executable download. Because of the file size, the SharePoint Server 2013 package has been divided into two separate downloads. One contains the executable file (identified as ubersrv2013kb2850024fullfilex64glb), while the other contains the .CAB file (identified as ubersrv_1). Both are necessary and must be extracted to the same folder to successfully install the update. Both are available by clicking the same Hotfix Download Available link in the KB article for the release. See the KB article of the SharePoint Server CU for more details. We are progressing very quickly. Today we’ve published the 4th lesson in the SharePoint 2013 Administration Arabic course to SharePoint4MEA YouTube channel. Today’s lesson is all about “Creating SharePoint 2013 Web Application”, you can watch it from here . Last but not least, and thanks guys for the amazing feedback!